"Welcome Home" - this should be the name of Ivana and Ksandro's apartment rentals. We rented a total of six apartments from February to May 2013 and our team enjoyed the stay in all of them - and each were uniquely different and in great locations throughout the city. The hospitality from Ivana and Ksandro was top of the line, from being met at the airport, arranging a long-term driver (Drazen is the best! ), to arranging wine tastings - must go to Bornstein's and say hello to Doris (best hostess - very enjoyable, truly a WOW - Woman of Wine) and the walking tour with Ivana - what can I say, it was like spending time with a friend - which it was! Excellent facilities, well appointed, good location! Thank you for the kind hospitality. We thoroughly enjoyed our visit to Zagreb. Ivana, the tour was great! 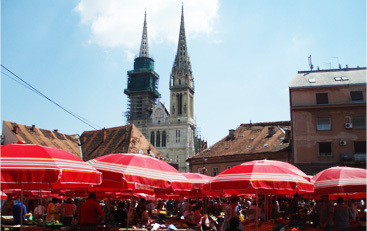 We would recommend inZagreb to anybody coming for a visit. We rode the train to Jarun park today - it was a disappointment. But we enjoyed the train ride and seeing more of the city. Sorry we broke a glass this morning, getting it out of the dishwasher. Really nice apartment! Enjoyed it very much! It was great! We felt very comfortable. Easy booking, thoughtful suggestions... We just came here and could enjoy our stay. Thank you! Love, love, loved it! So happy to have found this on the internet. Will highly recommend it to friends and colleagues. Location is absolutely perfect! Love the interior! Perfect greeting at the airport. City tour with Ivana was fantastic and gave us more history and story behind the sites. Always resposive immediately. The apartment was great. We wanted to be close to the main square and we're glad you recommended it. We also had everything we needed. Thanks for the warm welcome and the tourist information. We used the museum booklet a lot. Thanks for the very nice place to stay. We were sorry we didn't stay longer. Again, all was great! Perfect for us and you both have been amazing! Thanks. Absolutely amazing! Thanks so much! Just slightly mroe expensive than a youth hostel and so much better! We will tell our friends and will be back! Excellent position + facilities. Beautiful decor with a warm friendly feel. Stan je ekstra. Opremljen je odlično i ima sve što treba. Lokacija je odlična. Šteta što idem dalje. Very beautiful apartment, very clean. Everything was perfect from the start to the end. Thanks a lot! We'll recomment to our friends! We have been very lucky to be able to travel every year for the past few years and we have visited some amazing places and stayed in some very nice apartments. We are not wealthy, so we are try to find apartments that are well-positioned, well-equipped and moderately priced. But there is always some uncertainty about what you will find when you arrive in a new city or town. Will our accommodation be OK? Will it be in the right location? Will we be able to find it without any trouble? Will it have all the equipment we need to look after ourselves and prepare our own meals? There was something special about our stay in Zagreb. To start with, Ksandro picked us up at the station on a Saturday night, when he should have been home with the family - and the train was more than an hour late. But Ksandro was there, without complaint and eager to help us settle into our apartment and tell us all about Zagreb. The apartment was delightful. It could not have been in a better location, in a very quiet position but just metres from the main town square and the market, within short walking distance of many of your beautiful attractions, and the apartment itself was ideal for our needs.When we had a problem getting the television to work Ksandro was at the apartment within the hour. Perhaps that is the level of service that we should expect wherever we go, but we have not found that to be the case. Ksandro made us feel very welcome and that influenced how we feel about Zagreb and Croatia (and what a wonderful country it is - we have visited more than a dozen countries in Europe, and Croatia is by far the friendliest, and it is a truly beautiful country).Indeed, perhaps the most memorable and special aspect of our short stay was the kindness and friendship that Ksandro offered to us. Again, thank your for a beautiful apartment and for the wonderful service that Ksandro provided to us.